One of my favorite things about spring is the abundance of gorgeous and delicious vegetables. Let's face it, most vegetables need some serious help to invigorate any sort of flavor and I just don't believe anyone who says that vegetables are naturally delicious, because quite honestly, there's a reason why eating them seems like a chore for most people. I'm a huge fan of roasting, but now that windows are open and warm air is streaming in to our tiny apartment, limited oven use is a must. While roasting does tend to bring out the most wonderful flavors, grilling can have the same effect. Since we live in a tiny Jersey City apartment with no personal outdoor space to speak of (yet), I once again broke out the Foreman to whip up some zucchini coins that transformed the standard vegetables from eh to mmmm. The salt is a must to bring out the delectable flavors, just make sure that you don't overdo it on the grilling - nothing says ack more than squishy veggies. Instead, grill for a few minutes only, get some nice brown crispy marks and chow down. 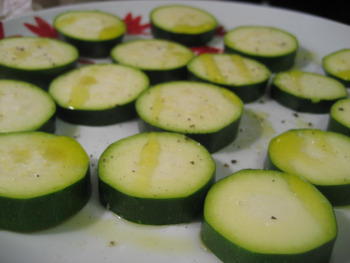 Slice zucchini into thick coins and spread out on a plate. 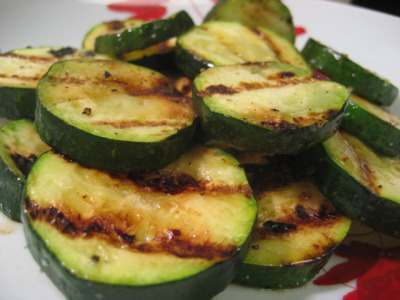 Drizzle with olive oil and generously sprinkle salt and a little bit of pepper on each side of the zucchini. Grill until tender, serve and enjoy!